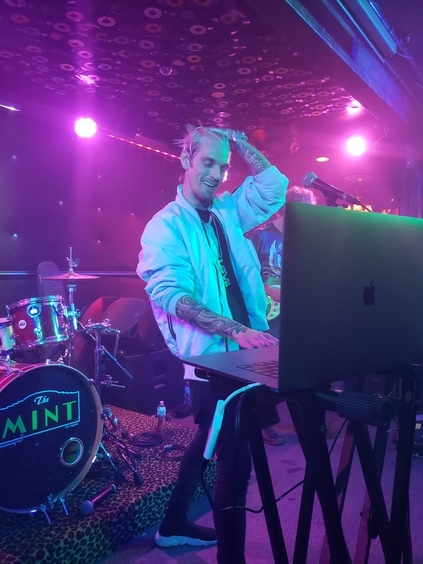 Aaron Carter performs “Fool’s Gold” at The Mint. Photo by Jessica Klausing. Admit it, you so wanted to join Aaron’s Party. Aaron Carter photo by Jessica Klausing. “Bad 2 Good” and “Dearly Departed” dazzled fans with more slick, exuberant synths. Everyone was on their feet dancing the night away. Carter seemed to be having the time of his life as well. The blond singer was all smiles as he stepped away from his keyboard to bust a few smooth dance moves. Just as things were starting to heat up, a few minor screeching speaker issues threatened to delay the fun. “Bro, I promise I’ll buy you new speakers if they blow,” Carter assured the venue’s sound guy from onstage. Aaron Carter prepares for the next song. Photo by Jessica Klausing. “Champion” was the most emotional song of the night. The song was written to honor Carter’s father, who passed away from a heart attack in 2017. His father’s last voice mail was played before the song. “No, not yet. But it’s coming! Don’t worry!” Carter assured the room. “This is a song that was written 60 years ago and it goes a little something like this,” Carter said as he launched right into “I Want Candy,” his other hit from the 2000s. Needless to say, the fans were not disappointed with this particular song choice! Aaron rocks out to “Aaron’s Party (Come Get It).” Photo by Jessica Klausing. Nothing compared to the hype from “Aaron’s Party (Come Get it)” though. Fans literally screamed out the lyrics word for word, almost overpowering Carter’s vocals at times. Carter had a few tricks up his sleeve as he remixed his traditional pop track to incorporate a trap beat. The night ended with Carter lending his honey sweet vocals on “Sooner or Later.” Fans hollered for an encore, which he was more than happy to oblige. He returned onstage for another remix of “Fool’s Gold” ending the night on a dance party high. If you come to an Aaron Carter concert expecting to hear his old childhood hits, then you’ll be sourly disappointed. You may get a nostalgic throwback or two but Aaron has made it clear in interviews that he wants to move on with his music career. His new music is comprised of eclectic trap EDM remixes with honest lyrics reflecting past failed relationships and loss. 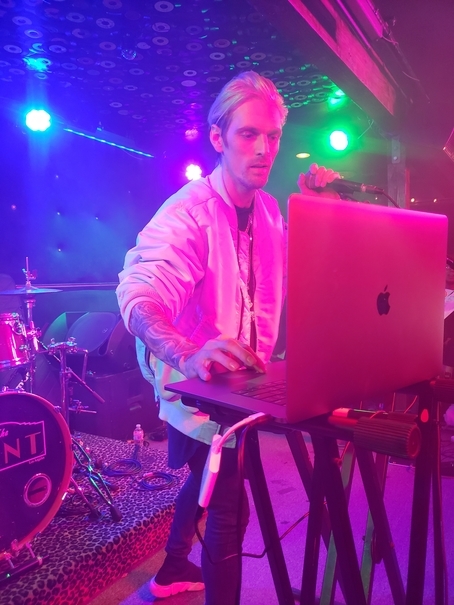 Aaron Carter may have matured but his newer catchy tunes can still pack a dance floor!